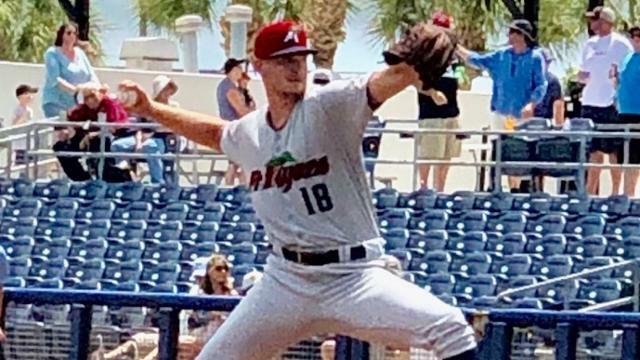 PORT CHARLOTTE, Fla. - Jake Palomaki knocked home Tyler Frank with two outs in the 10th inning to lead the Charlotte Stone Crabs past the Fort Myers Miracle, 2-1, on Sunday afternoon at Charlotte Sports Park. Palomaki's run scoring hit marked the game's first run since the third inning. For the second straight game, the Miracle scored the game's first run, plating a run in the first inning on a Jose Miranda two-out seeing eye single to left. Charlotte tied the game in the third on the legs of Vidal Brujan. The speedster led off the inning with an infield single to third. The 21-year old then stole second and when the throw from Ryan Jeffers went into center field, advanced to third. He raced home when Akil Baddoo booted the ball. The Miracle were charged with two errors on the play. Bailey Ober shined for the Miracle in his first start of the season. The former 12th round pick (2017) allowed an unearned run while striking out 11 across six innings. The right-hander struck out the side in his final inning of work. Calvin Faucher followed Ober and tossed two shutout innings before giving way to Alex Phillips. Phillips (0-1) allowed a run in 1.2 innings. The trio of Ober, Faucher, and Phillips teamed up to fan 19 Stone Crabs. The Miracle return home on Monday night to open a four-game series with the Dunedin Blue Jays, the Class-A Advanced affiliate of the Toronto Blue Jays. Miracle southpaw Charlie Barnes makes his first start of the season. First pitch is slated for 6:30 p.m.